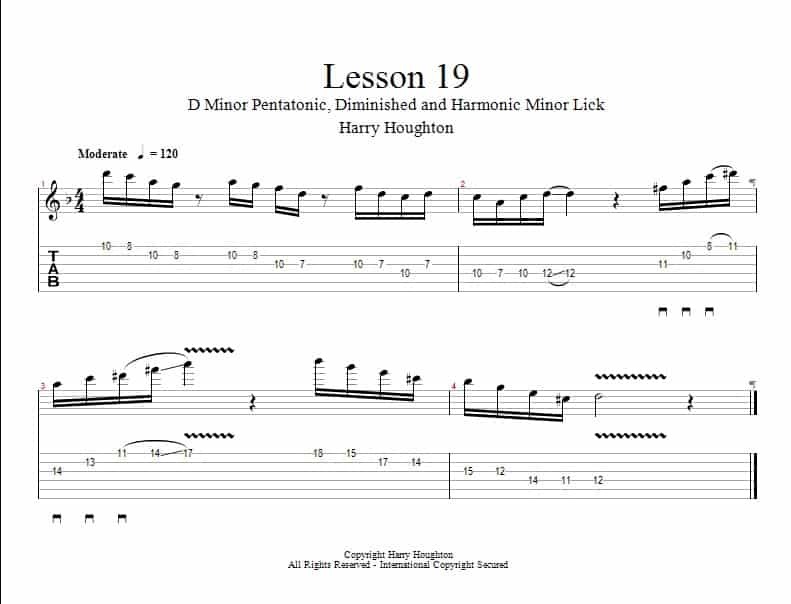 This month we will be using the D minor pentatonic scale, some diminished sweeps, alternate picking and the harmonic minor scale all in one lick. We begin with a simple sixteenth note alternate picked descending pentatonic fill, starting at the D at the tenth fret of the high E string and play D to C at the eighth fret, and then A to G at the same frets on the b string. We then rest for an eighth note, before re-descending from the A to the G then down to the F and D notes at the tenth and seventh notes of the G string. We then rest for another eighth note before completing this lick by playing the F and D notes again at the tenth and seventh frets of the G string, then we head down the C at the tenth fret of the D string, back up to the D, then down to the C again, then down to the A at the seventh fret of the D string, before finally heading back up to the C and then sliding into to the D at the twelfth fret of the D string. We then rest for one beat before we sweep through two diminished shapes starting at the F# at the eleventh fret of the G string, sweeping through A at the tenth fret of the B string, and C at the eighth fret of the E string and then hammering on to the D# at the eleventh fret. We then repeat this a minor third up starting at the A at the fourteenth fret of the G string sweeping through A, C at the thirteenth fret of the B string and D# at the eleventh fret of the E string before finally hammering onto the F# at the fourteenth fret of the E string and sliding up to the A at the seventeenth fret. The third and final part of this lick uses another diminished pattern, this time descending again in sixteenth notes starting at the eighteenth fret of the high E string down to the G at the fifteenth fret, and then continues descend 2 notes per string through the E and C# at the seventeenth and fourteenth frets of the B string, the B flat and A at the fifteenth and twelfth frets of the G string, and finally the E and C# at the fourteenth and eleventh frets of the D string, then resolving onto the D at the twelfth fret. As we are finishing on the C#, this gives us a harmonic minor kind of a flavour which gives us another option when playing minor pentatonic.